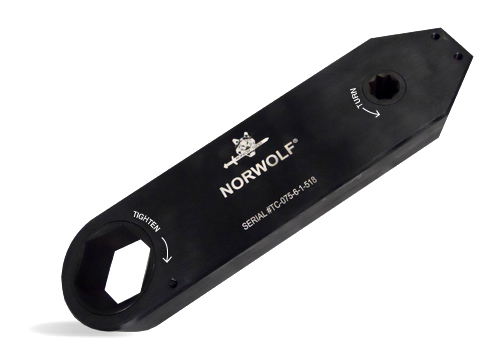 The Norwolf Missing Link™ torque multiplier fits into tightly confined areas where sockets will not fit. The Missing Link has become standard in the wind industry for generator feet and yaw pucks. The newly re-designed 6:1 Missing Link fits in the narrowest of confines while maintaining a high power to weight ratio. • Accurate—operates using levers, not gears. • No overload pins to break—creates safer working environment. • Uses ratchet or non-ratchet wrenches. • Optional reaction arm permits operator to react on the same plane. • Input force is same direction as reaction force for maximum operator convenience.